Go Tell Iraq's Catholics About The "Lesser of Two Evils"
The allegedly "pro-life" President of the United States of America, George Walker Bush, who supports the surgical slicing and dicing of innocent preborn babies in certain "hard" cases and who is a total supporter of all forms of contraception, whose administration approved over-the-counter sales of the "Plan B" emergency contraceptive pill, which acts as an abortifacient, was championed as the "lesser of two evils" eight years ago when he ran against then Vice President Albert Arnold Gore, Jr. Although I was four years away from coming to the conclusion that voting in our Judeo-Masonic system is a gigantic waste of time and actually enables the false, naturalistic, religiously indifferentist, anti-Incarnational and semi-Pelagian principles upon which the modern civil state, including the United States of America, is founded, I wrote article after article to explain that there were no essential differences between Gore and Bush, both of whom were statists at heart who disagreed with each other here and there on matters of emphasis and approach. Statism has indeed increased under the administration of the "compassionate conservative," George Walker Bush, in ways that would have been politically suicidal for a "President" Albert Arnold Gore, Jr. Agencies of the Federal government of the United States of America now have vastly increased powers to conduct espionage on the activities of ordinary American citizens, many of whom are considered as potential "terrorists" when they attempt to open bank accounts or embark upon that exercise in misery and penance called commercial air travel, while the flood of illegal immigrants into this nation has continued unchecked. The human pesticide, RU-486, remains fully legal nearly eighty-six months after Bush took office, having been joined by the equally murderous "Plan B" "emergency contraceptive," courtesy of the Bush administration's Food and Drug Administration. Federal funding for domestic and international "family planning" programs has increased dramatically in the past eighty-six months while the agenda of those in favor of perverse sins against the Sixth and Ninth Commandments continues to make as many inroads in various Federal agencies as it does in popular culture. An immense, grotesque expansion of the powers of the Executive Branch of the government of the United States of America has taken place that would have made Josef Stalin envious of what can take place in a "democratic republic" as average citizens are diverted by bread and circuses. A sham of a partial, conditional ban on "partial birth abortions" was passed by Congress, putting an end to all serious talk at the national level, especially in presidential politics, of attempting to secure full legal protection of each preborn human being without any exceptions whatsoever. As I have noted many times (An Illusion of a Victory), the partial, conditional ban on partial birth abortions will save not one preborn life as the "ban" contains a "life of the mother exception" and as the ban leaves completely intact two other means (hysterotomy, dilation and evacuation) by which babies may be killed with perfect legal impunity in the latter stages of pregnancy (a reality to which Associate Justice of the Supreme Court of the United States of America Anthony Kennedy made specific reference in the case of Gonzales v. Carhart.) Although the debate over partial birth abortion, also known as "intact dilation and extraction," highlighted the cruelty of a particular form of baby-killing, it also misled people into believing that such executions of the preborn were more morally heinous than those that take place earlier in a baby's development inside of his mother's womb. The truth of the matter is, of course, that each abortion, whether chemical or surgical, is the exact same crime in the eyes of God: the direct, intentional taking of an innocent human life made in His own image and likeness. Yes, you see, the devil wins no matter who gets elected in the United States of America. It is really, really simple to comprehend: the devil must the king of any nation that does not place itself and every aspect of its laws and popular culture under the Social Reign of Christ the King as He has revealed Himself to us exclusively through His Catholic Church and which does not publicly honor and venerate His Most Blessed Mother as its Immaculate Queen. Those who want to believe otherwise might as well believe in the tooth fairy. A belief in the ability of naturalistic politics to "change" the world for the "better" is of the essence of Modernity in the world and of Modernism in the counterfeit church of conciliarism. Nothing but disaster results, although it seems to be so very difficult for ordinary Catholics to recognize this truth in light of even the empirical facts of how things get worse and worse no matter who is in office. Ah, but the masses of deluded "pro-life" Americans want to convince themselves that "progress" has been made. It has not. Indeed, George Walker Bush has been a moral disaster as the President of the United States of America, a man who has not only presided over an increase of funding for--and expansion of the availability of--abortifacient contraceptives but unleashed a needless, immoral and unjust invasion of a sovereign nation while providing the American public with misleading information about the "evidence" supposedly linking Iraq's now executed dictator Saddam Hussein, a brutal thug in his own right, to be sure, with al-Qaeda and about Hussein's alleged "stockpile" of "weapons of mass destruction." Death and destruction has been visited upon a people whose government posed no legitimate threat to American national security, subjecting American military personnel to injury and death for no good reason as families of National Guardsmen were torn asunder and as the American treasury was pillaged to pay contracting firms, many of whose executives had ties to officials in the Bush administration, to rebuild Iraq's infrastructure that was destroyed by the American bombs which were paid for by American taxpayers. As has been noted on other occasions on this site, the rebuilding of Iraq's infrastructure has been so slipshod that more millions upon millions of American dollars have had to be spent to rebuild the rebuilding process in many places. Hussein stockpiled the weapons sold to him by the United Sates of America, choosing not to use them in the war against Iran, which did not end until 1988, and used them instead on the Kurds in northern Iraq following the conclusion of the Persian Gulf War in 1991, a war that was launched to expel Iraq's forces from a country, Kuwait, which Hussein believed that American Ambassador April Glaspie on July 25, 1990, had signaled to him was not of significant enough interest for the United States of America to do anything other than express a verbal condemnation in its behalf should he, Hussein, decide to reclaim Iraqi land that was taken away from it following the end of World War I. Thus it is that the former American "ally" during the era of the Iran-Iraq War, Saddam Hussein, became the focal point of President George Walker Bush's "axis of evil" in 2001, 2002 and 2003 leading up to the American invasion of Iraq on March 19, 2003. A man, George Walker Bush, who had said when he was running for President of the United States of American in the year 2000 that he was opposed to efforts to engage in "regime change" and nation-building" did exactly this in Iraq to do the bidding of the State of Israel at the behest of the war-mongering neoconservatives who believed that they could remake the Middle East in a manner that would "help" the Zionists in Israel to crush all opposition to their hegemonic schemes of regional control. Please, go tell the Iraqi people that George Walker Bush was the "lesser of two evils." Despite the much vaunted "surge" of overtaxed American forces last year, death and destruction are being dealt upon innocent civilians in Iraq on a daily basis. Sure, Saddam Hussein was a tyrant. As bad as he was, however, he killed the same amount of people during a reign of over thirty years as are killed in this country on an annual basis by means of surgical abortions alone, not counting the millions more who die as a result of abortifacient contraceptives and embryonic stem cell research and in vitro fertilization. Hussein was not allied with al-Qaeda. The last thing that an organized crime head such as Hussein wants is a potential rival to power, which is why Iraq's borders were sealed shut to the likes of al-Qaeda until after the American invasion in 2003 made those borders as porous as the border between the United States of America and the United States of Mexico. Hiram Johnson also noted that "the first casualty when war comes, is truth," an observation that is certainly applicable today as the Bush administration keeps sending American military personnel into the midst of a civil war between various bands of Mohammedans that has no relationship to American national security whatsoever. A power vacuum in Iraq was created by the insane dreamers who overthrew a despotic thug without realizing that other despots would replace him by means of the ballot box to seek revenge upon the supporters of the now-hanged thug (Saddam Hussein). Borders that were closed tight to Shiite and al-Qaeda operatives have been blow wide open. Thousands upon thousands of innocent Iraqi civilians have been killed by American bombs and by the carnage that has been unleashed as a result of the unjust American invasion and occupation. Iraq's infrastructure was destroyed and the efforts by American war profiteers, who have been paid by American taxpayer dollars, to reconstruct that infrastructure have been proved to be so shoddy that it is necessary to finance the reconstruction of the reconstruction in many instances. Basic services such as electricity and water are hard to find in areas where they were once plentiful and easy available. Billions of dollars generated by Iraq's oil industry are missing, plundered by the new caste of leaders who are repeating Hussein's own crimes. Iraq's Catholics and members of the various Orthodox sects, both of whom were enjoyed great social mobility during the Hussein regime, are being persecuted with special ferocity that seems not to faze Bush and Cheney in the slightest. Oh, yes, "the first casualty when war comes, is truth." For war that is waged on the basis of the pursuit of the ever-illusory belief that man can forge "peace" and "order without submitting himself to the Deposit of Faith that Our Lord has entrusted solely to the Catholic Church and without having belief in, access to and cooperation with Sanctifying Grace is itself a monstrous lie that winds up worsening conditions and embittering the hearts of men. 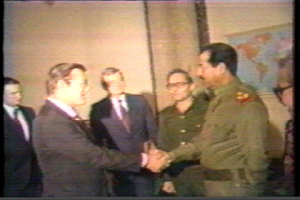 Saddam Hussein had a vested interest to protect the lives and the rights of Eastern rite Catholics in Iraq. As a secular Mohammedan, Hussein's Baath Party and his clan from Tikrit mattered far more to him than making Iraq into what it has become, a stronghold of Shiite Mohammedanism that has pitted Shiites against the Sunnis in pitched battles that were impossible during his brutal, autocratic rule (just as Josip Broz Tito held the warring ethnic and religious factions in the artificial entity known as Yugoslavia together by brute force until his own death in 1980, at which point the Balkans began to collapse and then dissolve into warfare and "ethnic cleansing," following by William Jefferson Blythe Clinton's NATO intervention and bombing of Serbia in behalf of the Mohammedans in Bosnia and Kosovo). Catholics are protected in Iraq no more. Their ranks have been decimated by the largely unreported, at least in the Western press, of attacks upon them by Mohammedans (that "religion of peace" George W. Bush, the "lesser of the two evils," keeps talking about) and by the exodus of many thousands of them into other Middle Eastern countries to flee from the violence and destruction. So it is that the Chaldean Catholic Archbishop of Mosul, the Most Reverend Paulos Faraj Rahho, was kidnapped on February 29, 2008. His body was found in Mosul on Wednesday, March 12, 2008. Leaving aside the late Archbishop's association with the counterfeit church of conciliarism (issues of survival in Iraq have taken precedence over issues of the Faith about which we have been so greatly and so rightly concerned here in the West), he was killed for his Faith in Our Blessed Lord and Saviour Jesus Christ and for being a visible representative of the Catholic Church in Iraq. He was targeted because he was a Catholic, a true bishop of an ancient and venerable Eastern rite of the Catholic Church, whose episcopal lineage was entirely of the Chaldean rite. We must pray for the repose of the immortal soul of Archbishop Rahho and for the safety of other Catholics throughout Iraq as the madness--and there is no other word for it other than madness--unleashed by the United States of America continues unabated. Oh, there are those who will say that the United States has launched a war against "Islamo-fascism," which is nothing other than an empty slogan. How can the United States presence in Iraq be considered a "crusade" against "Islamo-fascism" when it is believing, practicing Mohammedans of the Shiite sect who have more or less "winked" at the civil war taking place between Shiites and Sunnis and as Catholics and members of Orthodox sects are being harassed and shot at and killed, their stores and homes burned to the ground in many instances. There was no legitimate reason to destabilize the country of Iraq. Monies spent to make Americans "more secure" have gone to undergirding regimes that are as corrupt and only slightly more tyrannical than that of the United States of America, where the exercise of tyranny is masked under the usual fascist guises of "national security," patriotism" and the newer slogan of "the global war of terror." All the while, you see, Catholics in Iraq and Pakistan and elsewhere in the Mohammedan world have been put more at risk and subjected to all manner of persecution without too many words of concern, no less, protest emanating from Washington, District of Columbia, United States of America. Oh, well, why should there be any protests over the plight of Catholics in the Mohammedan world in the wake of the American invasion of Iraq, which is not a "crusade" against Mohammedanism or "Islamo-fascism," by the way. George W. Bush has gone out of his way to call Mohammedanism a "religion of peace." The American invasion ousted a corrupt secular Mohammedan dictator and replaced him with equally corrupt religious Mohammedans who fight with each other as they squander American aid money and do little to stop sectarian violence or to come to a meaningful, enforceable agreement on sharing the nation's oil wealth, oblivious to the suffering of Iraq's Catholic community. Please, the the "global war on terror" is not a "Christian" crusade against Mohammedanism. Far from it. If it were, ladies and gentlemen, there wouldn't be such silence in the wake of the persecution of Catholics in Iraq, now would there? Alas, Mohammedan violence against Catholics is tolerated by the government of the United States of America because it needs someone in Iraq to fill the power vacuum caused by the ouster of Saddam Hussein. Remember, the government of the United States of America was actually complicit in the slaughter of over a quarter of a million Catholics in Mexico in the 1920s and 1930s. The government of the United States of American saw to it that Protestant "churches" and Masonic lodges were started in Catholic lands following its victory in the unjust and immoral Spanish-American War, taking untold numbers of souls out of the Church in the name of American "civil" and "religious" liberty. And the government of the United States of America was mostly deaf, dumb and blind to the plight of Maronite Rite Catholics in Iraq in 2006 as the forces of Zionism bombed their homes in Lebanon, displacing nearly a million of them in the process with hardly a word of this moral disaster being reported by the "mainstream" media. The government of the United States of America will only rarely criticize something done by their Zionist puppeteers in Tel Aviv and Jerusalem. How ironic it is that Mohammedan violence against Catholics must now be tolerated in order to do the bidding of the Zionists in the creation of the "democratic" Iraq! American lives have been wasted in this effort to build "peace and security" on the basis of war conducted under false premises and designed to pursue illusory objectives. American families have been torn apart for months and years on end as their loved ones, including mothers of children who had signed up to serve in the National Guard (which exists to deal with emergencies of various levels in the fifty states and, as a last resort, in other parts of the nation if pressed into service for that purpose), have served in Iraq or been deprived of their fathers because of long stints in rehabilitation centers following injuries sustained in Iraq. Although figures vary, estimates of the Iraqis killed since 2003 range from 300,000 to 600,000, a third of these having been caused by the invading/occupying forces. The American invasion of Iraq has been nothing other than a moral disaster from beginning to end, especially when one considers the war upon souls that the invaders' government unleashed in 2003 when sending in "family planning" information and pills and devices almost immediately in the aftermath of the invasion itself. Ah, yes, American "liberation." American "civil liberty." Americanism will solve all, right? No. Catholicism is the foundation of personal and social order. Nothing else. Compounding this moral disaster is the fact that Joseph Ratzinger/Benedict XVI believes that the solution to conflicts in the Mohammedan world is for Mohammedan states to embrace the conciliar concept of "religious liberty" that is considered to be an "obligation" in an irreversibly "pluralist" world. While there are some secular and religious Mohammedan intellectuals who may agree with such an approach, at least on some level or another, the plain fact of the matter is that efforts to convince Mohammedans to adopt the heretical notion of "religious liberty" will never succeed. Most believing Mohammedans in Mohammedan countries (yes, even in those Mohammedan countries that are more secular than Iran, for example) do not accept pluralism of any kind. Public displays of Christian symbols are forbidden in Saudi Arabia, where the oligarchs who enjoy their oil wealth do not want to offend mullahs who could arouse enough people to rise up and send them off to exile. The spirit of Gaudium et Spes and Dignitatis Humanae is not coming to a Mohammedan nation anytime soon. Indeed, Ratzinger/Benedict shows himself to be a driven man by the way that he promotes "religious liberty" and "healthy secularity," extolling the pluralism of the United States of America as the "model" for the rest of the world. He has an evangelical zeal for these false concepts. Imagine if he had true apostolic zeal to seek with urgency the conversion of those who are steeped in false religions, including those, such as Talmudic Judaism and Mohammedanism and Hinduism and Buddhism and animism, whose adherents have souls that are steeped in the ravages of Original Sin, inclining them all the more to engage in acts of violence and to hate others rather than to forgive past injuries and to will their good. No, Ratzinger/Benedict must adhere to the iron-laws of conciliarism just as any other revolutionary must cling to his ossified formulas long after their false premises have been exploded and been proven to be harmful for men and their nations. Ratzinger/Benedict must mouth Judeo-Masonic platitudes about "brotherhood" and "solidarity" while refusing repeatedly to explain to non-Catholic leaders who visit him (yes, I know, another non-Catholic leader) that Catholicism is the one and only foundation of personal and social order. Alas, one cannot give what he does not possess. As Joseph Ratzinger does not believe that Catholicism is the one and only foundation of personal and social order, you see, he is incapable of exhorting others to accept the true Faith. The Prince of Peace need not apply for the rights of absolute exclusivity as the one and only means of personal and social order. As a true conciliar revolutionary committed to false ecumenism and inter-religious "dialogue," Joseph Ratzinger believes that it is "enough" for Catholics to have a "place" in the marketplace of ideas. A permanent place in the "marketplace" of ideas is not "good enough" for God. The path of peace of the Divine Redeemer, Our Blessed Lord and Saviour Jesus Christ, runs through the Sorrowful and Immaculate Heart of Mary, not through the illusory and delusional promises made by candidates for public office of the two major organized crime families in the United States of America, the Democrat Party and the Republican Party. There is, as I indicated in When Lesser is Greater, no such thing as a "lesser" evil as the false opposites of the naturalist "right" and the naturalist "left" contend with each other to see who can be the better statist, who can be the better at using the brute power of American imperialism or the surrender of American national sovereignty to Judeo-Masonic international organizations to achieve "peace" and "security." Both the Republicans and Democrats are but two sides of the same naturalistic, religiously indifferentist, anti-Incarnational and semi-Pelagian coin. Anyone who thinks that enabling either of these two sets of naturalists will produce social order is sadly mistaken. Catholicism is the one and only foundation of social order. The Sorrowful and Immaculate Heart of Mary is the path to personal and social peace. Hasn't Our Lady herself told us so in her Fatima Message? Shouldn't we pray as many Rosaries each day as our states in life permit and also add the devotion of her Seven Dolors to our daily spiritual life if we have not done so already? Lastly, we must say a few words of the measures and dimensions of her Compassion. We have drawn such a picture of it as we are able. It not only falls far below the truth, but it sensibly falls fall below the real image of it in our own minds. A thousand unexpressed thoughts are teasing us at this moment, but the difficulty is how to express them fitly. Words do not seem to be measures for them. They are thoughts of love; and love does not speak; it burns. Moreover, there must be limits to all things except loving. There are not limits there. Love is an eternal work. Love alone can measure the Compassion of Mary. Think of the sufferings of Jesus. They open at our feet like a huge abyss. Can we fathom their dreadful depths? Or do we not rather shrink in conscious nothingness from a task so hopeless and so rash? Yet Mary's Compassion contains that world-wide abyss, measures it, and holds its miraculously within its own dimensions. It we speak of the beauty of Jesus, straightway the vision of a shoreless sea, which no horizon bounds, over which the sun is rising and setting at the same moment, the half disk sunken in the west already rising in the east, and the waters rolling on and on for evermore. Yet as are the waters of that beauty, so were the waters of Mary's bitterness. By an opposite miracle to that of Moses, the wood of the Cross thrown into those waters of beauty has converted them into bitterness. If we think of men's cruelty in the Passion, it is a mystery nearer to our understanding; yet it is not that nearness almost an infinite distance? Are we not obliged to call to our aid the theory of diabolical possession? even then the horrors of the Passion are almost incredible, because they are so nearly inconceivable. Yet these horrors were but a part of Mary's Compassion; and truly, compared with the wrath of the Father, and the beauty of Jesus, they were the very least part of it. If we think of her deep love of Jesus, it is only to delight in its interminable magnificence. It is beyond our definitions, out of the sphere of our comprehension. We make wild comparisons of all angels and of all saints, indulge in fanciful arithmetic, repeat our superlatives, but we only do so to convince ourselves more satisfactorily that it is all beyond us, just as a man uses violence with himself to be sure he is awake. Yet the dimensions of that love do not each to the dimensions of her Compassion, because there is another love yet, to which it marvellously outstretches. It is the deep love of Jesus for her. Who can tell it? Who can speak of it even figuratively? for where is our figure to come from? Yet the breadth, and the depth, and the height of that love of Jesus for His Mother are the only true dimensions of her Compassion. Here are five abysses, five measure, five standards, His sufferings, His beauty, men's cruelty, her deep love of Him, His deep love of her. We must do our poor best with them all, and we shall reach a view of our Blessed Mother's Compassion which will be good for us and acceptable to her, but it will be below the truth. A work which Jesus sand Mary made together, out of God's wrath and man's sin, and the Hypostatic Union, and the sinlessness of a pure creature, must be a marvel about which at best we can but stammer, and lovingly go wrong; and such a work is Mary's Compassion. Our task is ended, and love will give our poor thoughts a truth of its own which will make them good for souls. Some will continue to blather about the "lesser of two evils" as the dose of the so called "lesser evil" because higher and higher with each passion election cycle. We must not listen to this blather in the slightest or give it the slightest degree of credibility or consideration. The modern Judeo-Masonic state is evil. It needs to be replaced by the Social Reign of Christ the King and Mary our Immaculate Queen, a work that starts with our own total consecration to Our Blessed Lord and Saviour Jesus Christ through the Sorrowful and Immaculate Heart of His Most Blessed Mother and the enthronement of our very homes to these same matchless twin Hearts of Love and Compassion. We are changing the world by the changing of souls to the true Faith, starting with our own on a daily basis as we cleave to true bishops and true priests in the catacombs where no concessions are made to conciliarism or to the nonexistent legitimacy of its false shepherds. The true religion is Catholicism, not conciliarism, not any secular, naturalistic ideology of the "left" or of the "right." We must enfold ourselves into the love of the Sorrowful and Immaculate Heart of Mary and the Most Sacred Heart of Jesus as we make reparation for our own many sins, which are so responsible for the worsening of the state of the Church Militant on earth and of the world-at-large, as we seek to restore all things in Christ the King and Mary our Immaculate Queen.